Delhi (/ˈdɛli/, Hindi pronunciation: [dɪlliː] Dillī, Punjabi pronunciation: [dɪlliː] Dillī, Urdu pronunciation: [dɛhliː] Dehlī), officially the National Capital Territory of Delhi (NCT), is a city and a union territory of India containing New Delhi, the capital of India. 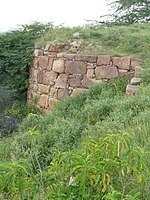 It is bordered by Haryana on three sides and by Uttar Pradesh to the east. The NCT covers an area of 1,484 square kilometres (573 sq mi). According to the 2011 census, Delhi's city proper population was over 11 million, the second-highest in India after Mumbai, while the whole NCT's population was about 16.8 million. Delhi's urban area is now considered to extend beyond the NCT boundaries and include the neighboring satellite cities of Faridabad, Gurgaon, Sonipat, Ghaziabad and Noida in an area now called Central National Capital Region (CNCR) and had an estimated 2016 population of over 26 million people, making it the world's second-largest urban area according to United Nations. As of 2016[update], recent estimates of the metro economy of its urban area have ranked Delhi either the most or second-most productive metro area of India. 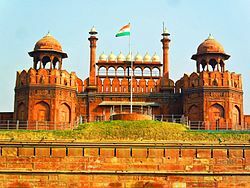 Delhi is the second-wealthiest city in India after Mumbai, with a nominal economy of $110 billion for the entire Union Territory, and is home to 18 billionaires and 23,000 millionaires. 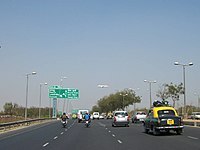 Delhi features a dry-winter humid subtropical climate (Köppen Cwa) bordering a hot semi-arid climate (Köppen BSh). The warm season lasts from 21 March to 15 June with an average daily high temperature above 39 °C (102 °F). The hottest day of the year is 22 May, with an average high of 40 °C (104 °F) and low of 28 °C (82 °F). The cold season lasts from 26 November to 9 February with an average daily high temperature below 20 °C (68 °F). The coldest day of the year is 4 January, with an average low of 2 °C (36 °F) and high of 14 °C (57 °F). In early March, the wind direction changes from north-westerly to south-westerly. From April to October the weather is hot. The monsoon arrives at the end of June, along with an increase in humidity. The brief, mild winter starts in late November, peaks in January and heavy fog often occurs. According to the World Health Organization (WHO) Delhi was the most polluted city in the world in 2014. In 2016 WHO downgraded Delhi to eleventh-worst in the urban air quality database. According to one estimate, air pollution causes the death of about 10,500 people in Delhi every year. Air quality index of Delhi is generally Moderate (101–200) level between January to September, and then it drastically deteriorates to Very Poor (301–400), Severe (401–500) or Hazardous (500+) levels in three months between October to December, due to various factors including stubble burning, fire crackers burning during Diwali and cold weather. During 2013–14, peak levels of fine particulate matter (PM) in Delhi increased by about 44%, primarily due to high vehicular and industrial emissions, construction work and crop burning in adjoining states. 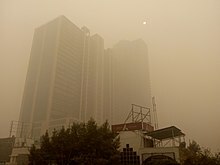 It has the highest level of the airborne particulate matter, PM2.5 considered most harmful to health, with 153 micrograms. Rising air pollution level has significantly increased lung-related ailments (especially asthma and lung cancer) among Delhi's children and women. The dense smog and haze in Delhi during winter season results in major air and rail traffic disruptions every year. According to Indian meteorologists, the average maximum temperature in Delhi during winters has declined notably since 1998 due to rising air pollution. India's Ministry of Earth Sciences published a research paper in October 2018 attributing almost 41% of PM2.5 air pollution in Delhi to vehicular emissions, 21.5% to dust/fire and 18% to industries. The director of Centre for Science and Environment (CSE) alleged that the Society of Indian Automobile Manufacturers (SIAM) is lobbying "against the report" because it is "inconvenient" to the automobile industry. Environmentalists have also criticised the Delhi government for not doing enough to curb air pollution and to inform people about air quality issues. In 2014, an environmental panel appealed to India's Supreme Court to impose a 30% cess on diesel cars, but till date no action has been taken to penalize the automobile industry. Around 49% of the population of Delhi lives in slums and unauthorized colonies without any civic amenities. The majority of the slums have inadequate provisions to the basic facilities and according to a DUSIB report, almost 22% of the people do open defecation. ^ "Senior IAS officer Vijay Kumar Dev to be next Delhi Chief Secretary". The Financial Express (India). 23 November 2018. Archived from the original on 20 April 2019. Retrieved 20 February 2018. ^ "Sub-national HDI – Area Database". Global Data Lab. Institute for Management Research, Radboud University. Archived from the original on 23 September 2018. Retrieved 25 September 2018. ^ a b "Census 2011 (Final Data) – Demographic details, Literate Population (Total, Rural & Urban)" (PDF). planningcommission.gov.in. Planning Commission, Government of India. Archived (PDF) from the original on 27 January 2018. Retrieved 3 October 2018. ^ "This study settles the Delhi versus Mumbai debate: The Capital's economy is streets ahead". Archived from the original on 21 December 2018. Retrieved 21 December 2018. ^ "Delhi Budget Analysis 2019-20" (PDF). PRS Legislative Research. Retrieved 11 March 2019. ^ a b Asher, Catherine B (2000) . "Chapter 9:Delhi walled: Changing Boundaries". In James D. Tracy (ed.). City Walls. Cambridge University Press. pp. 247–281. ISBN 978-0-521-65221-6. Retrieved 1 November 2008. ^ Cohen, Richard J. (October – December 1989). "An Early Attestation of the Toponym Dhilli". Journal of the American Oriental Society. 109 (4): 513–519. doi:10.2307/604073. JSTOR 604073. ^ "Why developers charge a premium for upper storeys in Delhi/NCR region". Economic Times. 5 August 2011. Archived from the original on 27 January 2013. Retrieved 30 May 2012. ^ Finbarr Barry Flood, 2003, "Pillar, palimpsets, and princely practices" Archived 30 September 2016 at the Wayback Machine, Res, Xliii, New York University, p. 97. ^ Mukherji, Anisha Shekhar (2002). The red fort of Shahjahanabad. Delhi: Oxford University Press. p. 46. ISBN 978-0-19-565775-3. Archived from the original on 27 March 2019. Retrieved 12 December 2018. ^ "In 1761, battle of Panipat cost Marathas Rs 93 lakh, say papers". The Times of India. 17 December 2011. Archived from the original on 29 October 2013. Retrieved 9 October 2013. ^ "Shifting pain". Times of India. 11 December 2011. Archived from the original on 27 January 2013. Retrieved 18 June 2012. ^ Travel Delhi. 1 January 2007. p. 8. ISBN 978-1-60501-051-9 – via Google books. ^ "New Delhi (SFD) 1971-1990". National Oceanic and Atmospheric Administration. Retrieved 6 June 2015. ^ "Ever recorded Maximum and minimum temperatures up to 2010" (PDF). Indian Meteorological Department. Retrieved 6 June 2015. ^ "Delhi, Blanketed in Toxic Haze, 'Has Become a Gas Chamber'". New York Times. Archived from the original on 8 November 2017. Retrieved 7 November 2017. ^ "Pollution level in Delhi: Day after Diwali, Delhi's air turns 'hazardous". Archived from the original on 8 November 2018. Retrieved 8 November 2018. ^ "Delhi breathed easier from January to April". Archived from the original on 9 November 2018. Retrieved 8 November 2018. ^ "Air pollution: Delhi enjoys cleanest February in three years". Archived from the original on 9 November 2018. Retrieved 8 November 2018. ^ "Usual suspects: Vehicles, industrial emissions behind foul play". Times of India. Archived from the original on 28 December 2018. Retrieved 18 December 2018. ^ "UA vicious nexus". Down to Earth. Archived from the original on 13 December 2018. Retrieved 18 December 2018. ^ "Delhi's air quality deteriorating due to burning of agriculture waste". Economic Times. 6 November 2014. Archived from the original on 11 November 2014. Retrieved 8 November 2014. ^ "Arvind Kejriwal to be Delhi Chief Minister, swearing-in at Ramleela Maidan". timesofindia-economictimes. 23 December 2013. Archived from the original on 11 May 2015. Retrieved 28 July 2015. ^ "Ministries in row over Safdarjung Airport land". The Times of India. 13 April 2011. Archived from the original on 27 January 2013. Retrieved 17 May 2012. ^ PTI (8 March 2019). "PM Narendra Modi inaugurates civil enclave at Hindon airport". The Economic Times. Archived from the original on 13 March 2019. Retrieved 10 March 2019. ^ "Cluster buses to be back on road today". New Delhi: The Times of India. TNN. 18 March 2018. Archived from the original on 8 May 2018. Retrieved 7 May 2018. ^ "Cabinet sets ball rolling to procure 1,000 cluster buses". New Delhi: The Times of India. TNN. 10 January 2018. Archived from the original on 7 May 2018. Retrieved 7 May 2018. ^ "Upswing in DTC, Cluster buses daily ridership, 41.90 passengers carried per day: Sisodia". Moneycontrol.com. PTI. 22 March 2018. Archived from the original on 7 April 2018. Retrieved 7 May 2018. ^ Aparajita Ray (16 June 2016). "Bengaluru retains second place after Delhi with most vehicles on roads". Bengaluru: The Times of India. TNN. Archived from the original on 14 June 2018. Retrieved 24 April 2018. ^ "Vehicle numbers cross one crore mark in Delhi". New Delhi: The Times of India. PTI. 4 June 2017. Archived from the original on 11 June 2018. Retrieved 24 April 2018. ^ Barman, Sourav Roy (10 August 2018). "Since 2013, 99% of Delhi Metro trips have been on time". The Indian Express. New Delhi. Archived from the original on 11 August 2018. Retrieved 11 August 2018. ^ Staff Reporter (23 November 2005). "French award presented to Sreedharan". New Delhi: The Hindu. Archived from the original on 17 January 2017. Retrieved 24 April 2018. ^ "Regional Rapid Transit System (RRTS)". Urban Mass Transit Company Limited. Archived from the original on 25 April 2018. Retrieved 24 April 2018. ^ a b "Project Details". National Capital Region Transport Corporation. Archived from the original on 3 May 2018. Retrieved 24 April 2018. ^ "Delhi polls: Caste to play crucial role". Archived from the original on 19 June 2014. Retrieved 15 February 2019. ^ Pioneer, The. "Delhi's Jats: From farmers to determined political climbers". The Pioneer. Archived from the original on 13 April 2019. Retrieved 10 September 2018. ^ Pioneer, The. "Fight for Brahmin votes intensifies". The Pioneer. Archived from the original on 13 April 2019. Retrieved 10 September 2018. 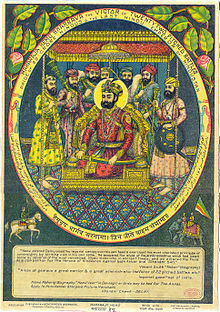 ^ Singh, Raj (6 February 2015). "Delhi Assembly elections 2015: Important facts and major stakeholders". India TV. Archived from the original on 12 April 2019. Retrieved 12 April 2019. ^ PTI (27 February 2009). "Promote lesser-known monuments of Delhi'-Delhi-Cities". The Times of India. Archived from the original on 11 August 2011. Retrieved 7 September 2009. ^ The Textile Book. 1 May 2002. p. 99. ISBN 978-1-85973-512-1 – via Google Books. ^ "Ancient and modern metal craft works attract visitors". Times of India. 12 June 2012. Archived from the original on 27 January 2013. Retrieved 18 June 2012. ^ "Delhi Metro records 10% rise in commuters-Delhi-Cities-The Times of India". Timesofindia.indiatimes.com. 1 July 2008. Archived from the original on 8 May 2013. Retrieved 3 November 2008. ^ Bremner, Caroline. "Top 100 City Destinations Ranking" (PDF). Euromonitor International. Archived (PDF) from the original on 25 August 2018. Retrieved 9 August 2016. ^ PTI (3 October 2010). 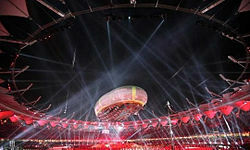 "Biggest ever Commonwealth Games begins in Delhi – The Times of India". Timesofindia.indiatimes.com. Archived from the original on 3 November 2012. Retrieved 14 October 2010. ^ "Ambedkar stadium to host India's World Cup qualifier". Times of Inia. 28 June 2011. Archived from the original on 10 July 2012. Retrieved 17 May 2012. ^ "Partner cities". Official Website of Yerevan Municipality. Archived from the original on 5 November 2013. Retrieved 18 April 2018.